THESE MODIFIED BALLS MAKE GOOD ELEMENTS FOR KINEMATIC SYSTEMS, WHERE THIS SIMPLE DESIGN CAN BE APPLIED. THIS GENERAL PURPOSE COMPONENT IS WIDELY USED BY THE GAGE INDUSTRY. THE .500", AND .750" BALLS ARE ALSO AVAILABLE IN INSTRUMENT QUALITY WITH 5 MICROINCH SPHERICITY AND ULTRA HIGH QUALITY WITH 2.5 MICROINCH SPHERICITY. 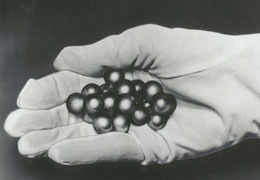 THEY ARE USED TO CONSTRUCT BALL BARS, BALL TREES, REFERENCE SPHERES, ETC. TUNGSTEN CARBIDE IS AVAILABLE ON SPECIAL ORDER.